Heavy rain forecast in southern Wisconsin for the Labor Day weekend will only add to the flooding woes crippling the region for the past 12 days. The National Weather Service issued a flash flood watch starting Friday evening through Saturday evening for south-central Wisconsin and southeast Wisconsin in the areas where the worst flooding has already taken place, including Sauk, Columbia, Dodge, Marquette and Green Lake counties. Flood warnings still are in effect on Madison's Isthmus because of the release of water through the Tenney Dam, and residents along the Baraboo River are preparing for more flooding due to record high water levels. 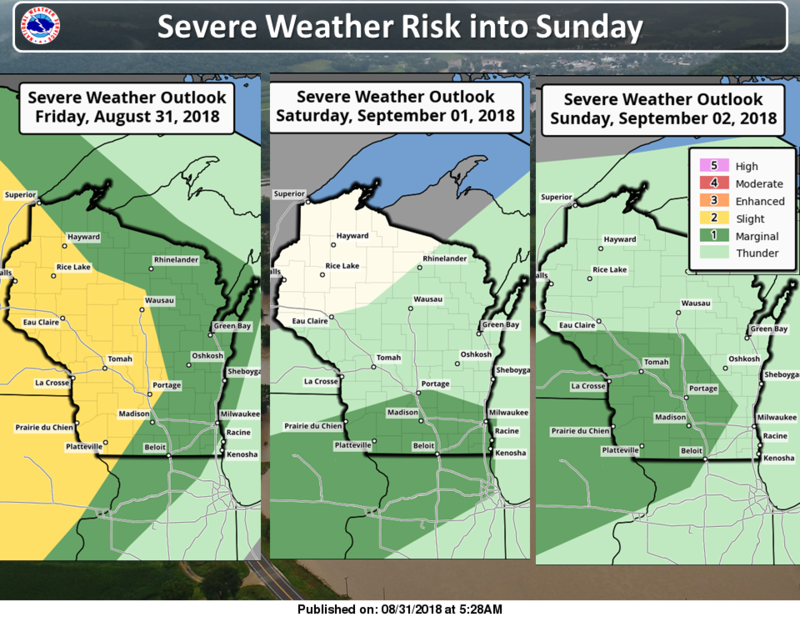 There is a slight risk for severe weather in southwest Wisconsin and a marginal risk in the rest of southern Wisconsin Friday night, with damaging winds and large hail the main hazards. There also is a marginal risk for severe weather on Saturday and Sunday, with damaging winds, large hail and heavy rainfall the potential hazards. The forecast through Monday night calls for periods of heavy rain, with up to 3 inches possible in some locales. 27 Storm Track meteorologist Guy Brown said it should be a nice day on Friday with partial sunshine and a high of 78, but showers and storms are expected to move through after midnight. Madison could see an inch of rain from the overnight storms, then another inch of rain Saturday into Sunday. The Weather Service said showers and storms will continue on Labor Day, with up to three-quarters of an inch of rain possible in Madison. Highs should be in the low 80s Saturday, Sunday and Monday. There's a slight chance for rain on Tuesday with a high of 85, Brown said. On Wednesday, rain chances increase and continue into Thursday, with highs around 80 both days. Brown is forecasting a high of 77 next Friday with showers and storms possible.